7’ wide by 7’ high by 9’ long Wedge Tent. 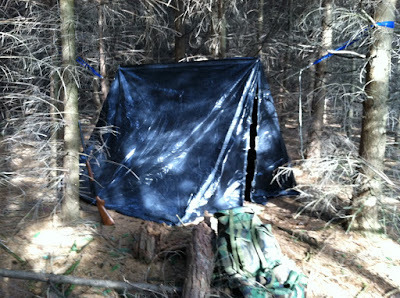 The Tent is suspended by a Ridge line made from 3 strand twisted paracord so it should be more than capable of standing up to falling branches since this has to be hung under trees. It also requires 6 pegs to secure the sides to the ground. The Dimensions were to ensure my Hammock would just fit inside the tent. really, really, dark in there. When waking up in the middle of the night I had to blink just to make sure my eyes were open! not very abrasion resistant but easily fixed by duct tape. So, here is the story of why and how I made my tent. 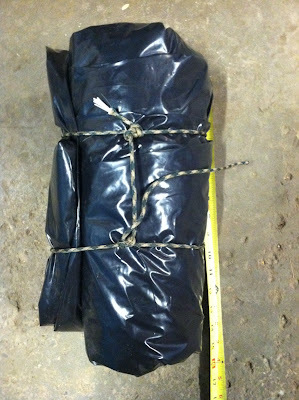 I knew i had a roll of black plastic sheeting in my shed that i picked up several years ago, can’t remember what for. The Plastic sheeting was 4mil 10’x25’. Basically the same thickness of the black construction garbage bags. I was planning on doing some overnight camping for hunting that year and the only Tent I had was a HUGE 10’ by 25’ three room tent that can really only be used for car camping. Since I’m cheap, and always looking for a new project to build I figured i’d try and make a simple wedge tent from the plastic sheeting. Using some taped together printer paper I made a 1:12 scale model of the 10’ by 25’ plastic sheeting and went about trying to get the biggest tent I could make. The model turned out to be 7’ wide by 7’ high by 9’ long. I had to wrack my brain trying to remember math for figuring out the size of the doors/wings. I cut out the pattern and set it up to make sure the angles were right, surprisingly I got it right on the first try. There were only 2 seams “i was hoping for none”. One at the ridge and one door/wing. Using a carpenters square, several tape measures, a silver sharpie, and some sharp scissors I cut out the main pattern from the plastic sheeting which was quite difficult as it slipped around a lot and it was much longer than my work space so everything was crumpled up. Here are the 3 individual pieces of the tent. Side 1 with both integrated wings. Side 2 with only one integrated wing. The separate Side 2 wing that will be attached later. Since I never had good luck with securing plastic sheeting to anything i decided to do a little experiment on how to best attach the pieces. I only found 3 methods that might work, everything else specifically said not recommended for plastic sheeting. There is a Scotch Tough Duct tape specifically for plastic sheeting but it says it’s not suggested for outdoors so that one was not tested. I used some of the leftover material to cut three sample pieces for testing the best way to secure the seams. I cleaned all the seams with an Alcohol soaked rag and once dry secured each one in a loop. Hint. Wipe in only one direction with the rag to remove the dust. I Inserted a piece of a 2x4 into the loop to give it some weight and hung them from a string outside for 1 week. The temps were anywhere from low 60’s in the day to below freezing at night. I also had quite a bit of rain and some winds that were so heavy it broke the jute twine they were hanging from. The LocTite glue failed after 3 days which surprised me. I thought that one was going to be the winner since it was the only one that said it would work with plastic. The Contact Cement held together for the entire 7 days but when taking it down I noticed I was able to EASILY peel the seam apart. The Scotch Tough Duct tape was surprisingly the winner. It was still holding strong and I could not pull it apart without fear of ripping the plastic sheeting. This made me quite happy since the tape would also be the easiest and quickest method to secure the seams. I left a 2 inch area at each seam to allow for overlap thinking I was going to be gluing the surfaces together. Since i’m going to be taping it now, the overlap is just providing some added strength. To secure the Tent to the ridge line and ground I secured some small stones with bonded upholstery mending thread. The stones in the top edges were then stitched into the three strand paracord ridge line so it won’t slide around in the wind and so the tent would not have to be pulled too tightly. because of the way the tied stones in the side work, it created some excess material between them so it should help keep wind out and hopefully any little creatures that want my warmth. The doors have duct tape along the edge to provide additional support to keep ties from pulling out in heavy winds. The Ties are made from Paracord threaded through holes punched with a paper hole punch. It’s surprisingly easy to pack up. I just folded the tent in half length ways. Then kept folding in half until it was about 16” wide. 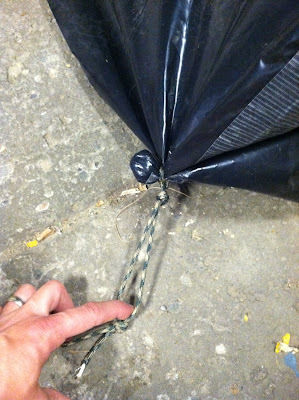 I then just rolled it up tightly and tied together with some more paracord. All packed up it’s not too big. The ridge line and all other cords ties are wrapped up in this bundle. I don’t have a scale but I’m assuming it’s right around 4.5lbs since the initial plastic sheeting was 4.78lbs according to the package Minus a whole garbage can full of scrap left over Plus the weight for the small rocks and paracord.